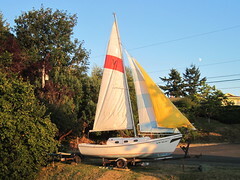 Today I sold one of my sailboats. I have had this boat for about ten years. It's only been used for a couple of seasons. I haven't used it for three years. It is a nice boat for family cruising, but for my usual needs the Montgomery is just right.I like the boat but can't justify keeping it around. Boats take lots of upkeep - even fiberglass ones. I have wanted to get it ready for selling the last couple of years, finally did it! The buyer is a retired teacher from the Portland area who I am sure will give it a good home and fix it up a bit. The grounds should look a little more tidy with just one boat and trailer around.